Anyway, when we moved into this house a year ago, we found that we were blessed with 2 Royal Ann cherry trees. (And no, I'm not being sarcastic in saying blessed, as cherries are Other Half's absolute favorite fruit.) However, this blessing (like any other?) brings responsibility as well and that would be consuming said cherries. Since we knew nothing about pruning the trees and never got around to it this winter, we have a rather abundant crop for just 2 trees. A week ago we got rather industrious with picking the cherries and ended up with 5 gallons to process-- yes, I filled that same bucket that the 30 pounds of strawberries came in the week before. These cherries, however, were certainly not pitted and ready to go, so processing them took way more than two and a half hours. Over the course of the next couple days, some were dried, some were juiced and made into popsicles, some were cooked into killer pies and scones (Other Half is quite the baker), and of course, I made more freezer jam. Batch Number 1 was made with my new favorite pectin, the Ball Freezer Jam Fruit Pectin (which I've since found is cheaper at Winco than at Bi-Mart for you local bloggy friends.) 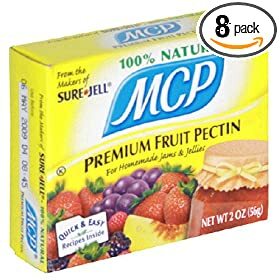 I love this pectin because it uses much less sugar than traditional pectin. For both my strawberry and cherry freezer jams, I used 4 cups of smushed fruit with 1 packet of pectin and only 1.5 cups of sugar for 6 jars of jam. (The packet say 5 jars, so we must have juicier fruit in Oregon.) With less sugar, I think the bright fresh fruit flavor really comes through and I feel like I'm eating smushed fruit, not loads of sugar. For Batch Number 2, Other Half wondered if cooked cherry jam might taste even better, reasoning that cooking the cherries would bring out their flavor even more. So the Jam Wars were on! I got out the pectin from the cupboard and turned to my trusty Ball Blue Book for a recipe for a cooked cherry freezer jam. This batch also made 6 half-pints, but only required 2 cups of crushed fruit (not 4) and used 4 cups of sugar (not 1.5). Besides the pectin, I also needed 1 tablespoon of lemon juice and 3/4 cup of water. Not only did this have more ingredients and more sugar, it required turning on the stove, something I do as little as possible when the temps are in the 90s. (OK, I do this as little as possible period, but it's not my fault that Other Half is a great cook as well as a great baker...) But, for the sake of the perfect jam, I tried to withhold judgment. So which batch won the Jam Wars? Thankfully, we both preferred Batch Number 1. Although cooking the cherries does change the flavor, the traditional recipe just has too little fruit and too much sugar to get that same burst of fresh cherry flavor. So lucky me, the easy way is the better way and I'll now be stuffing my garage freezer with no-cook cherry jam, along with the strawberry. SOunds YUMMY!!! The only thing we have growing here (besides children) are crab-apples. Any suggestions on how to use them instead of just picking them up out of the grass and throwing them away?? Have you tried any just plain canned cherries (not jammed)? My husband says he used to eat home-canned cherries as a kid and they were delicious. I haven't ever tried any type of preserving with cherries--not sure I have the time for all the pitting and whatnot, though I do LOVE cherries--but I'm curious if you've tried that, and how it turned out. And what recipe you used, if you did! Also, I think the absolute best thing to do with blueberries is just to freeze them. Same with raspberries. I've made blueberry jam and pies, but really I just like to freeze them and then enjoy them straight out of the freezer for snacks all year long. I only make strawberry and raspberry jam. I always heat up my jams a bit because I hate tasting the texture of sugar, it just smooths it out a bit. I prefer the MCP, but I use the directions that take the least amount of sugar. And I agree.....freeze the blueberries and skip making jam. Oh, and blackberry jam is excellent too if you have the resolve to pick them. We have tons of wild blackberries if you're up for a drive our way.